Heat oven to 350°F. Spray 13x9-inch (3-quart) glass baking dish with cooking spray. Cook and drain spaghetti as directed on package. Meanwhile, in 12-inch skillet, melt butter over medium heat. Cook bell pepper, celery and onion in butter, stirring occasionally, until tender. Stir in tomatoes, tomato sauce, cheese, salt and pepper; reduce heat to low. Heat, stirring frequently, until cheese is melted. 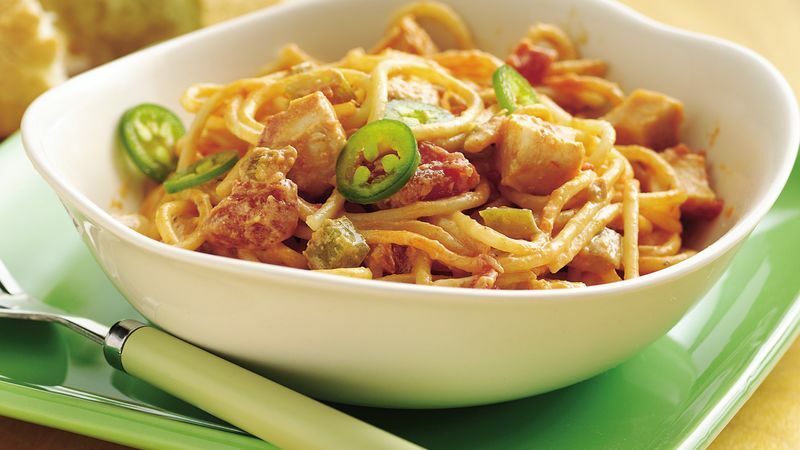 Stir in chicken and spaghetti. Spoon into baking dish. Bake uncovered about 30 minutes or until bubbly around edges. Top with chiles. Add your favorite taco toppers after baking. Good choices are sour cream, salsa, chopped tomatoes and shredded lettuce.